The Apostles themselves, having been called by Jesus to follow Him, thereby assisted Jesus to fulfil the will of His Father. In their tasks of proclaiming the message of salvation, they quickly found that additional help was needed from other Christians: "So the twelve called a full meeting of the disciples and addressed them - it would not be for us to neglect the word of God so as to give out food; you brothers must select from among yourselves seven men of good reputation, filled with the Holy Spirit and with wisdom, to whom we can hand over this duty'". The same need exists today to enable the People of God to hear His word, and to receive the Sacraments. Permanent Deacons, as members of the clergy, are ordained to the ministry "to participate in the three-fold function of teaching, leading and sanctifying, requisite for the building up of the community of the Church" (Lumen Gentium 20). Some people may be surprised to learn that the Bishops Conference of Scotland submitted a request for the approval of the Holy See for the restoration of the permanent diaconate as long ago as September 1980 that led to consultation with other countries who already had formation programmes in operation, and other interested parties. The resultant document was presented to the Bishops’ Conference in November 1982 and received unanimous approval on the understanding that it would depend on each individual bishop whether or not the permanent diaconate were established in his diocese, assuming that the Holy See approved the petition, which it did in May 1983. Almost immediately, the first two men- John Futers and Jacques Cook - were accepted as candidates by the Bishop of Aberdeen. In 1986 Dr. James Douglas, a former Church of Scotland minister, was ordained for the Diocese of Motherwell and in the same year John Futers and Jacques Cook were also ordained for Aberdeen. Deacon John Futers, under the direction of the Bishop of Aberdeen and in consultation with and assisted by those responsible for the Lancaster programme, established a programme of formation which was eventually responsible for the formation of deacons not only from the diocese of Aberdeen but also from the Diocese of Dunkeld and the Diocese of Motherwell who joined the programme in 1991 and 1994 respectively. By the late 1990s it was becoming obvious, in the light of with increasing demands upon the programme and the wisdom gained from experience, that a review of the programme was necessary. With the Holy See's publication of the Basic Norms for the Formation of Permanent Deacons and the Directory for the Ministry and Life of Permanent Deacons, the Scottish Bishops’ Conference established a working group led by Deacon John Woodside to investigate the way ahead in matters of formation, ministry and life of permanent deacons. To this end many people were consulted, both in the UK and abroad, with a view to understanding their formation experiences. In 2001 the Bishops of Paisley and Argyll and the Isles decided to restore the Permanent Diaconate in their dioceses. The working group completed a draft common policy document that was presented to and unanimously approved the Scottish Bishops’ Conference, and thereafter the revised Norms for Selection and Formation” were submitted to the Holy See for approval. This policy document contained common eligibility criteria; a common policy on the discernment, recruitment and selection processes; a common syllabus and course of studies; a common policy for the support of candidates and families during the process; and a common ongoing formation process following ordination. In November 2003, the two Scottish archdioceses, Glasgow & St Andrews and Edinburgh, announced that they planned to restore the permanent diaconate, and the Diocese of Galloway to joined the national programme in June 2005. The Permanent Diaconate Programme for Scotland continues to grow and in June 2009 twelve students were ordained for the Archdiocese of Glasgow and one for the Archdiocese of St. Andrews and Edinburgh. 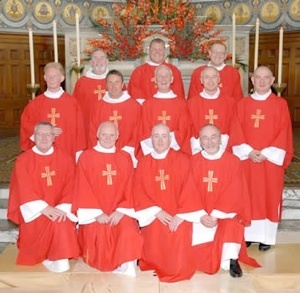 Given the earlier incardination of Deacon Gordon Tustin, formerly of Toronto, into the Diocese of Galloway, this meant that 2009 was the first year in which every diocese in Scotland had one or more permanent deacons; and the first ordinations within Galloway followed the next year. The Permanent Diaconate is now well established and increasingly well understood throughout the Catholic Church in Scotland.